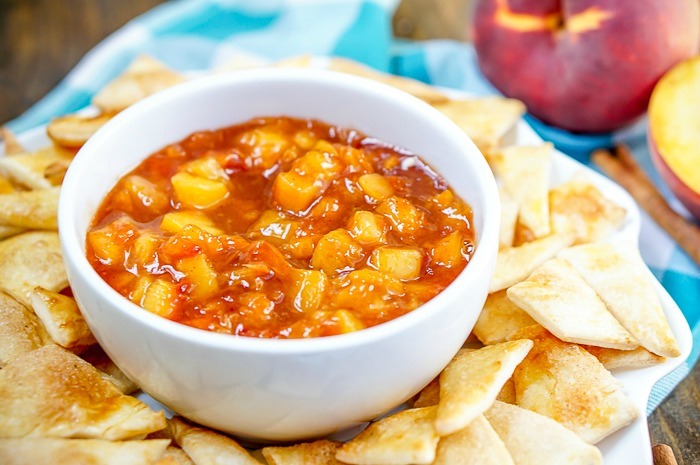 Start enjoying Peach Pie even sooner by making this delicious Peach Pie Dip and homemade Pie Crust Chips! I can’t believe it but this will be my last peach recipe of 2016 as the season is coming to a close soon. While I am so excited for fall to come into full swing and to start sharing lots of apple and pumpkin recipes with you all, I am a little sad to leave summer behind. Then again, we had far too many 90+ degree days while being pregnant. 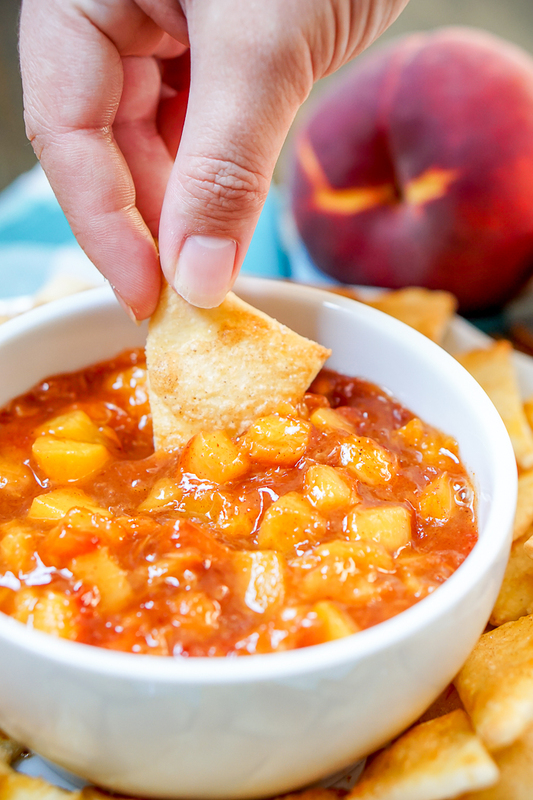 But let’s get to this Peach Pie Dip recipe. I have always loved peach pie or really any peach dessert, but who wants to wait for a whole pie to be made. Sometimes it just takes too long to make. Now, you can enjoy peach pie without that wait. 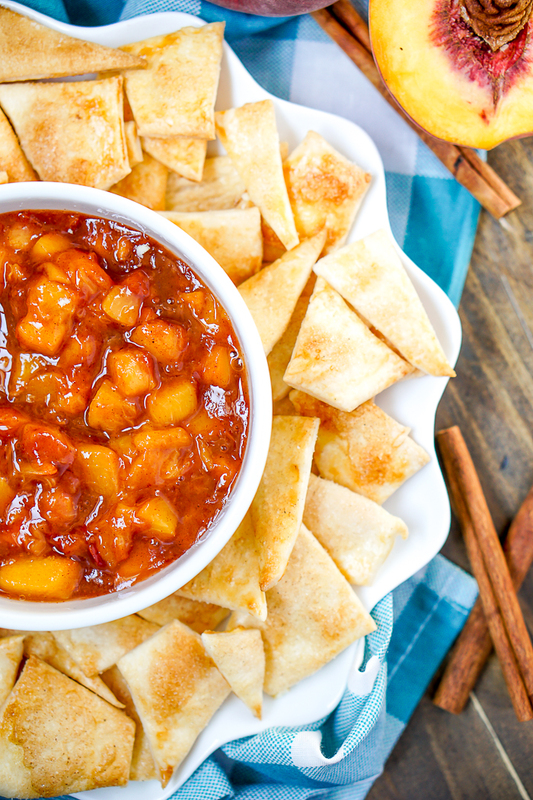 Throw all the tasty filling ingredients together and cook for a few minutes and you will have this sweet and tangy dessert dip to share with guests. Or to just eat all yourself – no judgement here! Dessert dips are definitely a favorite go to for me when we have guests for a couple reasons. One, it can just be put out for guests to snack on throughout the party instead of a more formal dessert time. Who doesn’t love to graze? Two, the prep time is quick so it makes party time quicker. Win win! If you like this recipe, you definitely need to check out this Caramel Apple Pie Dip from my friend Rebecca at Sugar & Soul. She’s amazing, and that dip is one of her most popular recipes. We made this dip together when she was out visiting and working to get me ahead before the baby comes. Plus, make sure you check out all the other peach recipes on the blog like Peach Pull Apart Bread and my homemade Peach Preserves.